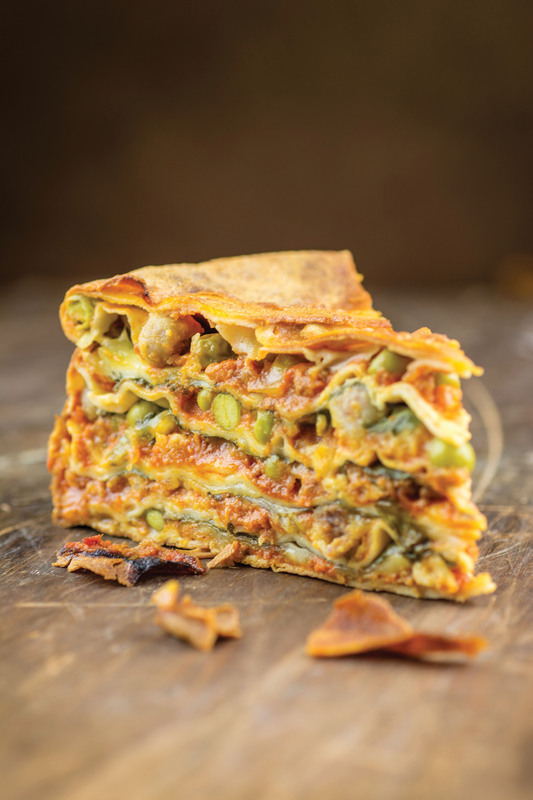 More than just a scrumptious Abruzzo ‘pie’, Timballo alla Teramana is a cook’s panoramic photograph of the fertile Teramo landscape. Its layers of scrippelle (water-based veil-like pancakes that mean crepe in dialect), mirror the strata of limestone and dolomite that uniquely form and fuse to create the Gran Sasso d’Italia, the province’s largest mountain range. Walking here, in-between or on top of those layers sit plump, undulating pastures, streams, rivers & crevices and fallen rock all combine to give the impression of the tiny meatballs, polpettine (locally known as pallottine), a rich ragù sauce, spinach or artichokes and scamorza that are richly layered in this dish. Despite not being a native, Timballo alla Teramana has become our family feast on Christmas Day. Most families have tweaked adoptions of some sorts at Christmas, it’s a tradition that dates back to Roman Emperor Constantine who adopted Christianity but insisted that it was celebrated on the official birthday of the Roman sun god Sol Invictus (“Invincible Sun”) on the 25th December! Last year we tried Danilo Cortellini’s recipe from his cookbook which was superb so we decided to replace the recipe we found online and replace it with this one! Sweat the chopped onion in a saucepan with a drizzle of extra virgin olive oil and a pinch of salt. Add the other vegetables and garlic and cook for 5 minutes. Then add a knob of butter and the pork and cook for 5 minutes. Now add the minced beef and season with salt and pepper. Cook for about 30-35 minutes until the meat has browned a bit. Pour in the white wine, and allow the alcohol to evaporate. Add a ladle full of water and the tomato puree. Then add some chopped rosemary and thyme and cook for another 15-20 minutes. Remove from the heat and set aside. Chop the onion roughly. In a large casserole dish, sweat the onion with the exra virgin olive oil and a pinch of salt. Cook until they start to caramelise, this wil bring out all the lovely sweetness of the onions. Once the onion is done add basil, olives and garlic and cook for a couple of minutes before adding the chili. When the onion, garlic and basil are golden pour the passata in. Add a pinch of salt and black pepper. Let it simmer for 15 minutes. A good tomato sauce does not need to be cooked for hours, no more than 30 minutes. The tomato sauce should be thicker, having been reduced by a third. For the mini meatballs knead together the meat with the egg and the bread until smooth. Season with salt and pepper and nutmeg. Roll the meatballs, they should weigh between 2-4g each maximum. Dust the meatballs with flour and quickly cook them with a teaspoon of olive oil and a knob of butter, fry till golden and crispy. Now prepare the crepes. Combine flour with the egg, water, milk and melted butter in a blender. Blend well, add a pinch of salt and pass the mixture through a fine seive to avoid lumps. Heat a small non stick frying pan wiith a drop of extra virgin olive oil. Use a kitchen towel to spread the oil evenly on the surface of the pan. Pour a ladle fo crepe mixture into the drying pan. Allow the mixture to spread over the surace of the pan and cook 1 minute on each side on medium heat. Repeat until the mixture is finished. This should make approximately 30-35 crepes to cool down on a tea towel. Boil the spinach and fresh peas. Cool down in iced water to retain their colour. Prepare an egg wash by beating the egg and well and dressing with salt and pepper. Grease a baking try with butter and start to pay a first layer of creepes on the bottom of the tray. Make sure the sides are also covered. Then proceed to layer with a spoon of tomato sauce, beef ragu, mini meatballs, spinach, peas, mozzarella and a sprinkle of parmasen cheese. Finish with a spoon of the egg wash, cover with a couple of crepes and repeat the operations until there is no more crepes. This will create a multi-layered lasagne like bake. Leave a few crepes to cover the timballo. Spread a couple of knobs of butter over the top of the timballo. Bake at 150C for 45 minutes. It will be golden on the outside, keep an eye on the cooking after 20 minutes. If it rises too much, pierce a hole through the layers for it to reduce in size. it is still very wobbly, allow another 10 minutes to cook and lower the temperature to 130C. Remover from the oven and allow to cool for 10 minutes before cutting and serve.